Mise en Place: Everything in its place!!! What a concept, to have everything in its place. I took an online cooking class two years ago and learned the culinary term “Mise en Place,” which is the French term for putting everything in place. If you ever watch any cooking shows, the chef has staff, I’m sure, putting each pinch of salt and pepper, each chopped clove of garlic, each tablespoon of spice or herbs in different little cups ready for the recipe. They are always arranged so beautifully by the time the chef arrives on the set. As a very average cook who is always in a hurry, preparing the Mise en Place seemed ostentatious and time-consuming. However, in my cooking course, I received a grade on how my Mise en Place looked, as well as how well I chopped, sliced and diced and finally, how photogenic my final presentation is. So, I learned the value (at least feedback value) of getting everything organized before I started. I also learned that, by having everything ready to go, it actually was easier. It took less time to prepare the dish when I had everything separated already. And, that way, I didn’t forget any of the ingredients, which, as an average cook, I had done many times. I’m sure my family remembers me making bread (in a bread machine) and forgetting the yeast, or that I leaving out baking soda or baking powder in a cake. Now, after cooking regularly for two years, I have also learned the term “Mise en Place” isn’t just for cooking. In working with Iron Butterflies Project and in teaching at Austin Community College, I am learning how to prepare my Mise en Place. For example, for the project, I have to organize the photos, the articles, the poems, songs and artwork. When I have everything ready, it’s easy to change the lead stories. I plan way ahead for conducting interviews if we write or record the stories. I work with the writers if they submit their own stories and with contributors to #MemberMondays or #TidbitTuesdays or even #ButterflyKisses. I think it’s even more imperative to prepare my Mise en Place because I work part-time. Not having an office means I have to be organized so I don’t sprawl everything all over the house and car. 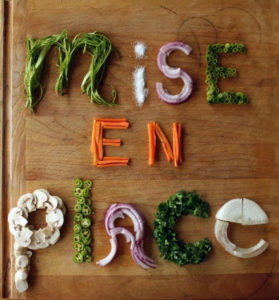 While my understanding of the French language is limited, my understanding of the term Mise en Place is enriched because of my online cooking course. Mise en Place gives me a sense of order so I can proceed to teach, write and create! Shelley teaches part-time at Austin Community College and works as a Communication Consultant in the public, private and non-profit sectors. She sits on the Board of Directors for FaithWorks of Abilene, a non-profit whose mission is to “help the underemployed, through personal, career, academic and spiritual development, acquire the confidence and skills for gainful and long-term employment.” Their motto is “it’s never too late to become what you might have been.” In other words, they create the environment for Iron Butterflies to flourish. http://faithworksofabilene.org. She married her college sweetheart, Travis Kessler, and they have two smart, strong, beautiful, successful and loving daughters, who married two creative, supportive, strong and loving men. They have one magnificent grandson, Thomas, who makes the world a better place through the twinkle in his eye and his infectious laugh. And, they are expecting their first granddaughter, Emilia, any day.